The Double Car Seat Adapter is the easiest way to turn your stroller into a customized travel system. You can even fold the stroller with the adapter attached, giving you the most versatile travel system available. This Baby Jogger Car Seat Adapter double allows you to turn your double stroller into a travel system by providing a place to securely attach your car seat to your stroller until your baby can sit in the upright seat. 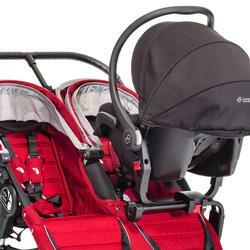 It is designed to work with select car seat models including the Maxi Cosi, Cybex and Peg Perego Primo Viaggo SIP and the Peg Perego Primo Viaggo SIP 30/30. It is not compatible with the Peg Perego 4-35. Compatible with the City Mini and City Mini GT double.